Did you qualify in IBPS Prelims 2015? Then the real recruitment starts only from now as the IBPS PO Main exam is scheduled on conducted on October 31st.There is no difference in the exam pattern compared to last year but candidates have to be careful as the competition is going to be less at this stage.Hence you need to make sure of not losing the josh at the last minute. Every year, approx. 10 lakh candidates appear for IBPS PO exams.To bring this number down & also to make it easy for the banks to select the brightest, a two tier exam process was conducted. Just like previous years 15000 - 18000 PO jobs may be announced by banks through this year `s recruitment as well. So, after the IBPS PO prelims results one can hope that expect atleast 2 - 3 lakh candidates could appear for the main examination. We arrived at this figure by taking into account the ratio of 1:20 – which is 20 times the total no. of vacancies. Candidates must not only successfully pass in this main online test BUT should also secure high marks so that their total final score enables them to get allotment in preferred govt. banks. There is NO descriptive paper. All the sections (expect english) will be available in English & Hindi language. Negative mark of 0.25 will be reduced for each wrong answer. Your score in main exam will determine whether you get shortlisted for the common interview or not.It will then be added to your interview score for final selection. IBPS PO 2015 – Will Cutoffs be Same? Having seen the previous year cutoffs, the million dollar question would be – What will be the cutoffs for this year? Since IBPS has already filtered many candidates through the prelims, the competition is NOT going to be high like in previous examinations.So we strongly believe the IBPS PO 2015 sectional & total score cutoffs could go up moderately. Even many bank coaches/ institutes strongly believe to see an increase in qualifying scores this year, primarily due to limited availability of talent pool. 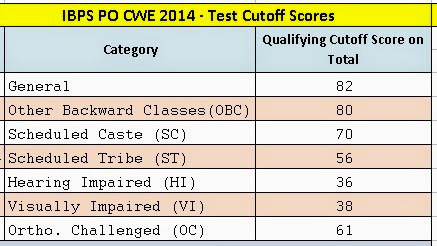 You can expect atleast 5 - 8 mark increase in sectional cutoff & 15 – 20 mark increase on TWS scores compared to 2014. * computer cutoffs were modified on Oct 23 in accordance to its total marks. Note: Do not prepare keeping these scores only in mind.The expected cutoff scores are provided as a starting point or guide to help candidates understand the weightage of each paper. Aim at posting a higher score than the above to increase your chances of getting selected. Checkout the IBPS PO Mains Study Plan article if you are preparing for future IBPS PO exams in 2016 – 17.